To shrink a DVD-9 movie to a blank DVD-5 disc with Any DVD Shrink, you need at least two DVD drives and at least one of them is a DVD burner. Then follow the steps below. 4. Insert a blank DVD-5 disc in another DVD drive which has DVD burning ability. 5. 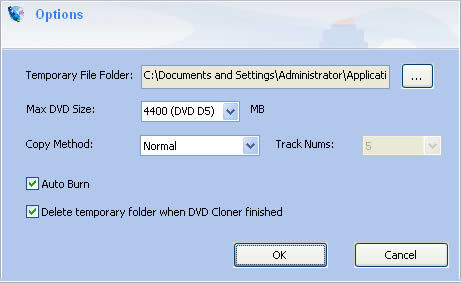 In output device dropdown list, select the DVD drive where the blank DVD-5 disc was inserted. 6. Click Copy DVD button and Any DVD Shrink will start to shrink the DVD-9 movie to the inserted DVD-5 disc. b. If you don't uncheck any items from the source disk, Any DVD Shrink will automatically shrink DVD-9 to DVD-5. c. DVD shrinking will lose quality, it's recommended to uncheck unnecessary content in order to keep the playback quality as good as possible.